Critics should not have heroes. The judgmental faculties need to be kept pristine with gallons of vinegar, poured from the barrel marked ‘Objectivity’. Yet I simply cannot help myself. Jean-Claude Vrinat is my hero. My excuse is that this great restaurateur has maintained Taillevent as one of the very best restaurants in the world, while at the same time somehow managing to remain a paragon of modest courtesy and quiet charm. And it can not have been easy. Over the past few years chefs at Taillevent have arrived and departed at the sort of rate which might have broken a lesser man. 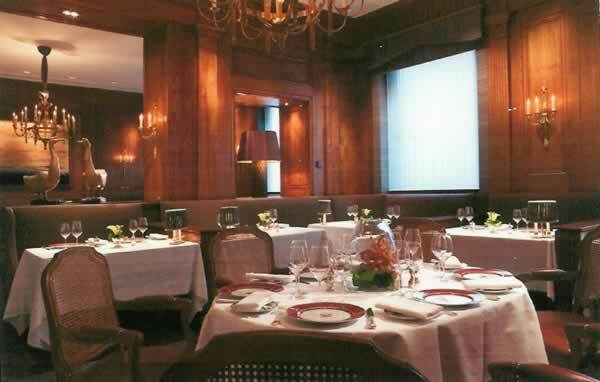 Taillevent is one of the noblest temples of La Cuisine Française. It has glowed in the light of 3 Michelin stars for thirty years. For a head chef to leave a three-star restaurant in France can be a national tragedy. For it to happen several times in the space of four or five years might cause the doom merchants to expect the end of a gastronomic institution. But such folk would be reckoning without the remarkable Monsieur Vrinat. I have observed before that a very good chef will arrive at Taillevent and be transformed, almost instantaneously, into a brilliant one. This is the Vrinat magic, and – on the basis of my recent meal – I can report that it is proving as powerful as ever. 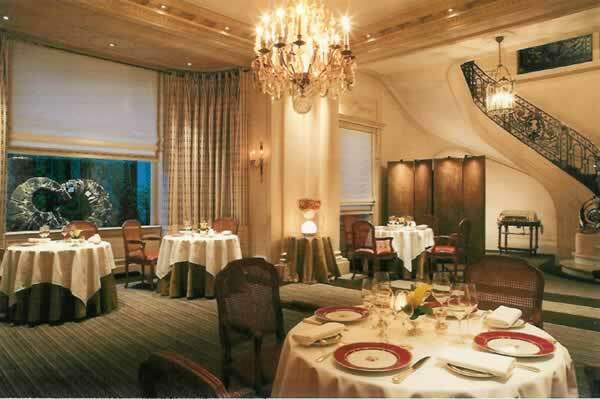 For nine years chef Alain Solivérès was in charge of the kitchens at the Restaurant Les Élysées at the Hotel Vernet. I enjoyed his food there and thought it fully deserved its 2 Michelin stars. Since December, 2002, however – when he took over the stoves of Taillevent – he has moved up to a higher, more refined level. His dishes are now, without doubt, of three-star standard. We can all breathe a sigh of culinary relief: Taillevent is safe. And Monsieur Vrinat is as elegantly imperturbable as ever – gliding this way and that, always present to ensure that a guest is made welcome, that a course arrives at precisely the right moment, that all is smooth and unhurried. But do not suppose that he resists all change. Since my last visit, the décor of this fine 19th century house in the 8th arrondissement has been subtly altered. The prevailing tones are now the warm ones of beige, brown and red. Spotlights have been carefully positioned to shine down on the white damask tablecloths. Modern paintings (by Naggar) adorn the walls. The lovely panelling has been lightened. I liked the seriousness of the old decoration. But I like the new style, too. It certainly has its effect on the diners. Whereas before this was one of the quietest dining rooms in Paris (I have seen a boisterous party of eight transformed to monkish whispering in less than five minutes), now the atmosphere is altogether jollier. Not noisy, you understand – for it is inconceivable that vulgarity will ever flourish within these portals. But jolly. I certainly felt jolly, as I eased myself onto the brown banquette, admired the shining Christofle cutlery and sparkling glassware (a mixture of Schott and the Riedel Vinum range), and allowed my eyes to rest on a sculpture of two large ducks. Waiters in dark grey suits and ties brought crisp bread rolls, glorious salty butter and, as an appetiser, a small dish of the best gazpacho I have tasted in years. All was starting well. The charming maitre d’, Jean-Charles Chareyre, arrived with the menu. Now, the menu at Taillevent deserves comment. It is single card, 26 inches wide by 19 inches high (yes, I have measured it), which is folded in half. On the front and back (pages 1 and 4) are printed the dishes on offer. These, I am pleased to say, include the puddings – as I like to decide upon my whole meal at the outset. (Separate dessert menus upset my equilibrium.) You will have noted that the menu card is of considerable size. This is pleasingly impressive, but it has a further purpose. Within – on pages 2 and 3 – are displayed all 310 bottles of the wine list. This is such a helpful arrangement that I simply cannot comprehend why it is not copied elsewhere. My first course was mushroom ravioli with an infusion of chervil. Presentation, as you would expect, was immaculate, with a bowl resting on a saucer atop a plate – all of the finest porcelain. Within was soft, translucent pasta, containing the essence of the fungus, wonderfully balanced by its broth. Brilliant. Next, the latest incarnation of a Taillevent classic, lobster sausage with an emulsion of tarragon and aniseed. Delicate and utterly enjoyable, although I judged a little more richness to the sauce would have been beneficial. Then some truly stunning lamb, rubbed with the sarriette herb and served with a jus with sweet pepper. If you have forgotten the tenderness and flavour of the finest lamb, cooked by a master, you need to eat this magnificent dish. Each mouthful was a revelation. And finally, to prove that, of the 23-strong team of cooks in the Taillevent kitchen, those who create the puddings are every bit as talented as their colleagues, a plate with a trio of delights: stewed mirabelle plums in a pot, crunchy chocolate and (a delightful conceit) a sorbet of olive oil. These four wonderful courses cost 170 euros, which for such food and such service in such a setting is a true bargain. Seven course set menus are also available at 130 and 180 euros. Sommelier Marco Pelletier chatted to me in a friendly and knowledgeable way about his wine list. (I could not place his English accent: it turned out to be French-Canadian.) I was impressed by his enthusiasm and his eagerness to bring me exactly the sort of wines I wanted. For the white, I asked for a big, firmly structured chardonnay, with butter and discreet fruit. And that is exactly what he brought – 1998 Hautes Côtes de Nuits (Dom. Jayer-Gilles – 66 euros). For my red, he was similarly spot on, with the magnificent star of the Languedoc, Grange des Pères (1999 – 120 euros). Decanted, it yielded masses of ripe black fruit and that touch of residual sweetness which always thrills my palate. These were lovely bottles. Indeed, such is my trust in this establishment, that I would expect any bottle on the list to be a fine example of its type. (All but 11 bottles are French.) And, although you can spend 2,000 euros on the 1934 Haut Brion, many of the bottles are in the 50 to 150 euro range. There are even six choices at 28 euros (from which the white Bergerac and the red Corbières looked tempting), so the bank need not be broken for a night out at one of the greatest restaurants in the world. Can I do any less for my hero? January, 2008 - The sad news has been received of the death of Mr Jean-Claude Vrinat. R.I.P. 15 rue Lamennais, Paris 75008, France.